Georgina McLeod has extensive experience in strategic communications and marketing in the non-profit, NGO, and government sectors, with vast experience in community engagement, advocacy, leading campaigns, ministerial papers, and policy. Georgina currently works as the Communications and Information Manager at QEII National Trust, a charitable trust working in private land conservation. She has previously served as communications and campaigns adviser for New Zealand Council of Trade Unions—working with other union campaigners and NGO groups to roll out CTU campaigns, focusing on high-level strategic planning and flexibility around the aims of the campaigns. She has had a variety of government experience from Sport New Zealand and High Performance Sport to IRD. Georgina brings strong governance and communication skills to the board and has been quite involved in our policy development and other documentation. 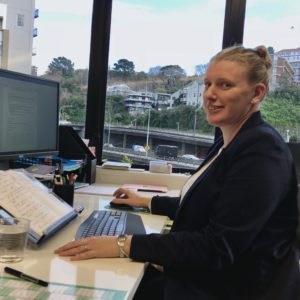 While not deafblind herself, she brings a strong sense of advocacy and what it means to be an ally to the deafblind community in New Zealand. Georgina is learning more every day about lived deafblind experience and is proud to support Deafblind Association New Zealand in the important work we are doing to support and advocate for deafblind in New Zealand. In addition to her work with the Deafblind Association of New Zealand, Georgina is kept busy with her two young daughters.